This article is about the Halo: Reach Easter egg. For the rank, see Sangheili Ranger Commander. A BOB armed with a Fuel Rod Gun on Tip of the Spear. BOBs are a special type of enemy encountered in Halo: Reach. 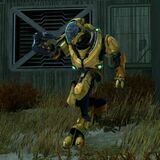 BOBs usually take the form of gold-armored Sangheili Rangers, but they have been known to take several forms, including white-armored Rangers or Banshees with infinite boost. The white-armored BOBs always dual-wield plasma rifles, regardless of rank. The gold-armored Ranger BOBs, on the other hand, have been seen with plasma rifles, plasma repeaters, concussion rifles, fuel rod guns, or energy swords. The BOBs' energy shields have the same strength of an Elite General. Each BOB remains in-game for a limited time before vanishing. For some BOBs, this time frame begins as soon as it is alerted to the player's presence. For others, the countdown begins once the player enters a certain area, thus it is possible for the player to miss the BOB entirely if it is not spotted. When the limit is reached, the BOB activates active camouflage and disappears completely. Killing a BOB will reward the player the "Seek and Destroy" medal. However, the medal can only be viewed on Bungie.net. In the post-game carnage report, the BOB is referred to as an "Elite light vehicle". On Bungie.net and Halo Waypoint, their description is simply "Wipe them out." The name "BOB" is a reference to Bungie's Marathon video game series. All human NPCs in the series are known as "BOBs". "BOB" is an acronym for "Born on Board", a reference to the characters having spent their entire lives aboard the eponymous colony ship. BOBs were first considered Easter eggs in Halo: Reach. However, in 2015 it was revealed in the "Sangheili" article in the Universe section of Halo Waypoint that the gold-armored Ranger is indeed a canonical rank, the Sangheili Ranger Commander. 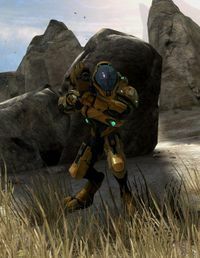 The white BOBs may also be canonical to some extent, as the Sangheili use a complex color coding which has never been properly depicted in the games, for gameplay purposes. For example, a white Zealot has made a canonical appearance in Halo: Escalation Issue 15. While looking for 3 Charlie, the player will find 3 different buildings, the first building is the one where the player cannot find 3 Charlie, it has 3 spawn point for the BOB, one for every small section of the place. The second building is located next to the river, it has 2 spawn points, one inside a basement with a broken wall and another next to the dead army troopers inside the building. The third building is located near the broken bridge, it has 2 spawn points, one on the dark building, next to the window, the other one is next to the dead civilians. Just before fighting the Hunters inside the base's garage, a random armored white Elite can be seen in the courtyard. Inside the base, on the fourth floor, a random armored White Elite can be found. A golden Elite ranger can be seen on the broken bridge where the dead militia is. One can be found on top of the smallest building on the settlement. One spawns next to dead militia soldiers on the bridge. After it spawns it will go to a rooftop and will stay there. When heading to the first AA Cannon, one can be found on the hill at the far left of the gun. After dropping down to the second AA gun location, a BOB can be found at the opposite side, near the Wraith. Although, the coding for this particular BOB doesn't trigger properly, and can only be spawned through complex glitching. One in front the crash site in the rocks. One on a cave at the far left of the crash site. One at the place where Bravo Generator is located on Invasion. A pod with a BOB inside can land on 3 random places. The first one is in front of the facility, over the small hill; the second one in almost the same place, but it will land near the human barricades; and the third one will land next to the platform where the Wraith can be found. One can be found on the main controls of the corvette on the bridge. One can be found when the player returns to the Hangar to defend the Pelican, on the top floor. When heading to the extraction point, a BOB piloting a Banshee will spawn near the docks and fly over the highest bridge. Just when the chapter starts, a BOB piloting a Banshee will spawn at the far right of the tower and will fly over the extraction point. Another one can be found while clearing the beach at the end of the mission if the player is near the bridge. Nomolos tower, heading to the sea. Nomolos tower heading to the glassed area. Near the Hospital heading to the sea. Near the Hospital heading to the glassed area. One can be found on the courtyard. One can be found inside the base atrium, next to the Datapad. On the final wave, a Phantom will drop one near the cliff. One will spawn at the far right of the area where a large battle is being fought under the UNSC Commonwealth, and is almost impossible to sprint where it is without getting it to despawn. The Spartan Laser found as you enter the area should be used. One will spawn in the garage on the next zone, exactly where the Scorpion spawns in Invasion. If the player manages to survive until the generals start spawning, a BOB will spawn on the open area at the left of the mission start. There are 7 spawn points for BOBs on the level Winter Contingency, referencing Bungie's favorite number. On page 384 of the Halo: Reach Official Strategy Guide, there is a list of enemy point values. In this list, there is an enemy called a "Daily Challenge Elite", which has the same point value of a BOB (200 on Normal difficulty). There are Daily Challenges awarded for killing a Golden Ranger-class Elite, including "What's Up Bob? ", "If It Bleeds...", and "Golden Opportunity." Banshee BOBs have no pilot, and do not award a Seek and Destroy medal, but they are considered BOBs for the daily challenge "Golden Tree City". To know where the BOB Banshee is, look for a very fast Banshee which avoids battle. In addition, its engines are always lit. The page about Sangheili Rangers in the Halo: The Essential Visual Guide has a BOB (later canonized as a Ranger Commander) as its profile image beside the main summary. Sometimes if you manage to assassinate a BOB, the timer will run out, but your player will continue the assassination animations, resulting in an interesting show. In the campaign portion of the Halo: Reach Demo, the BOB that would usually spawn during the assault on the ground facility in the level Long Night of Solace vanishes the exact moment it leaves the drop pod it arrives in. BOB variants in the level ONI Sword Base. The awarded medal for killing a BOB. A BOB Ranger with a Concussion Rifle. A BOB Ranger with a Plasma Repeater. A BOB Ranger with a Plasma Rifle. A BOB Ranger with an Energy Sword. A player assassinating a BOB. The challenge Golden Tree City. The image of the Ranger Commander in the Sangheili Universe article.